Learning how to dive is not a time consuming business. If you feel comfortable swimming in a pool, you should be able to enjoy scuba diving. With little time on your hand, you can become a certified diver. Once you do, Lebanon will have twice as much to offer. Professional training is a must however. The National Institute for Scuba Diving (NISD) is the oldest school in the business, with a high commitment to safety and education. Supervised by the school director with 24 years of experience and over 4500 dives, our instructors are skilled in introducing you to the marine environment in a responsible and enjoyable way. Apart from the local license, we work with the biggest diving institutes in the world: PADI (Professional Association of Diving Instructors), and IANTD (International Association of Nitrox & Technical Diving). 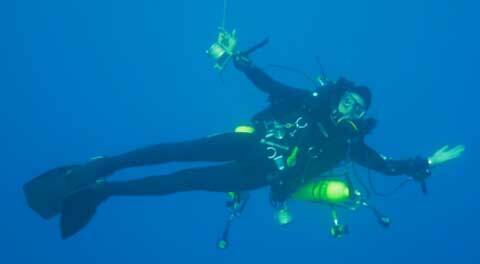 This IANTD program offers 3 theory sessions and 7 dives. Maximum depth 70 feet / 18 meters. Included in the course are: Complementary book, log book and wall certificate, all scuba equipment during pool and sea sessions, beach entrance, International license as well as insurance coverage throughout the course. This Program is designed to train Recreational divers in the safer use and technology of basic CCR diving with no decompression, up to 1.2 PO2 and to depths 21 meters. This course may be used as an entry-level course to SCUBA diving if combined with the Open Water program in which case Open Circuit dives will be substituted with CCR dives. This IANTD program offers 6 dives, covering 1 evaluation dive, 2 deep dives, 1 navigation dive, 1 wreck dive and 1 night or low visibility dive. Maximum depth 100 feet / 30 meters. Included in the course are: Complementary book, International License, Equipment during the course, beach entrance as well as insurance coverage throughout the course. This IANTD program has been developed to provide responsible training to divers who plan to dive to 130 feet / 39 meters on air. The IANTD Deep Air Diver program trains divers in skills, performance, theory and planning of deep dives. This program remains within the commonly practiced depth of 39 meters. It is the first sanctioned program to provide proper international training in safe deep diving skills and performance. It is recommended that this program be taught in conjunction with the IANTD Nitrox Diver program. This program provides recreational divers a safer breathing medium for enjoying dives in 12 meters to 39 meters depth range. The diver may elect to dive the mix on EANx tables or conservatively using their dive computers or air tables with an added diver safety margin. The IANTD Nitrox Diver certification is adaptable to being taught as a single program or by combining it with a variety of advanced or specialty diver courses. You can be specialized as Boat Diver, Wreck Diver, Night Diver, Dry Suit Diver, Search & Recovery Diver, Photography Diver, and Navigation Diver. Each specialty offers the diver a special knowledge and experience in a certain filed. 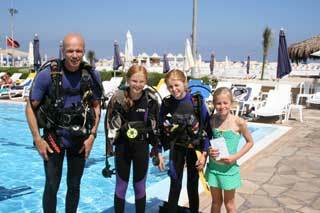 This program offers 2 pool sessions, theory classes and 2 sea dives. Included in the course are Complementary book, International License, Equipment during the course, beach entrance and insurance coverage throughout the course. This program is designed to extend the divers knowledge with O2 mixes of 22 to 40% and up to 50% for decompression, within a maximum depth range of 140 feet / 42 meters. It further develops diving skills and provides a greater understanding of the Nitrox diving concept. This program is designed to provide responsible training for those persons wishing to supervise standard IANTD divers, including Nitrox Divers, Advanced Nitrox Divers and Deep Air Divers. IANTD Nitrox Divemasters may supervise and assist in all open water IANTD diver programs but cannot conduct training exercise’s unless under the direction of a qualified IANTD instructor. 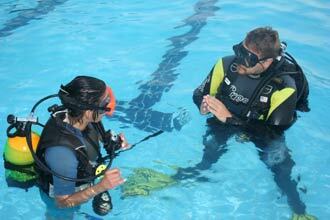 This program ensures professional, quality training to IANTD divers. An IANTD Nitrox Instructor teaches Open Water, Advanced Open Water, Nitrox and Open Water Nitrox Diver programs. What makes a great university differs from any other? It’s the system, the teachers and the reputation. At NISD, granted by over 1000 students and 30 Instructors, we have it all. Why become an instructor with us? Open since 1981, NISD has seen lots and lots of Instructors. Some were great Instructors, some were less great and some were… barely Instructors. To become just an Instructor is one of the easiest things you probably have ever done in your whole life. Few days of hard work and the title is yours; then what? Did you get that edge over the other million instructors in the world? Probably not, and probably, never will. To get that edge you will need our expertise in the field. At NISD, Walid Noshie has been in the diving business for over 2 decades with over 5000 dives. Becoming an Instructor with him will give you that edge in the diving field. Whether you are taking the Instructor course for a professional career or for just education, by the end of your training, you will feel that your knowledge has enhanced in many directions. Best said, it will give you the confidence and know how to teach your loved ones, SAFELY. And if you decide to work in the diving field, your education will help you to get hired by a dive center, easier, or to open your own dive center with less obstacles and difficulties. At NISD, all our Instructors are trained strictly with NISD, and this is what makes our training global. New students don’t need to choose their Instructor as all NISD Instructors have the same base. If you choose to become an Instructor, call us or drop for a visit, and speak to Walid. If you are serious enough about your education, you will find that this is the school for you. This program is designed to provide responsible training and directions for qualified IANTD Open Water Instructors that have a minimum of three years teaching experience on the methods and techniques of training IANTD Assistant Instructors and IANTD Open Water Instructors.